Boulder anti-fracking activists have had an incredible year so far when it comes to public relation fails. Whether it’s protesting the wrong house, holding a tone-deaf “Die-In” protest, or passing a stripped down “Climate Bill of Rights,” Boulder fracktivists clearly live by the mantra, “bad PR is good PR, right?” Par for the course, Lafayette City Council member Merrily Mazza skipped a city council meeting last week in favor of taking a 3,281-mile round trip to Ohio for a speaking tour touting her “success” in Colorado. So yes, here in Colorado it’s a bit ironic to hear Mazza going on a speaking tour hailing passage of a bill that she said was “toothless.” In fact, Mazza didn’t actually even vote on final passage of the bill. She was absent. Consensus from all parties proves that the stripped down “Climate Bill of Rights” doesn’t hold water, and is highly susceptible to litigation similar to what we’ve recently seen in Boulder. 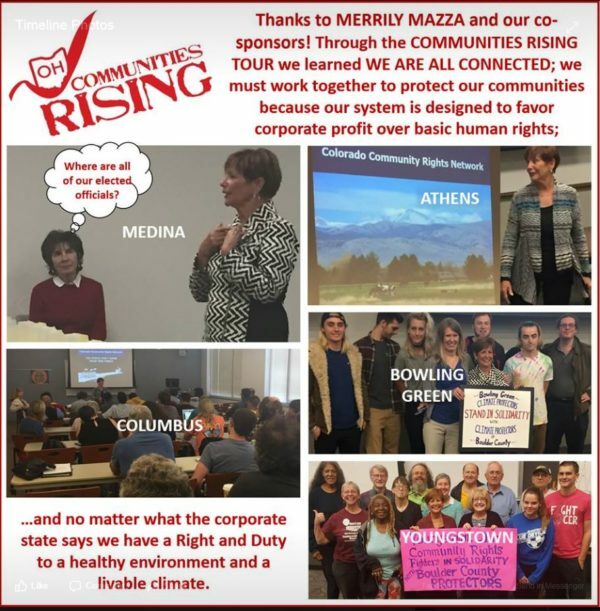 Meanwhile, Mazza was on a “Community Rising” speaking tour in Ohio to promote her heralded victory of passing the “unenforceable” and “unconstitutional” “Climate Bill of Rights” she championed in Lafayette. Traveling 3,281-mile round trip, Mazza left her anti-fracking supporters back in Lafayette with a false sense of security in the “symbolic” “Climate Bill of Rights.” This is just another addition to EBCU’s embarrassing run of PR fails.